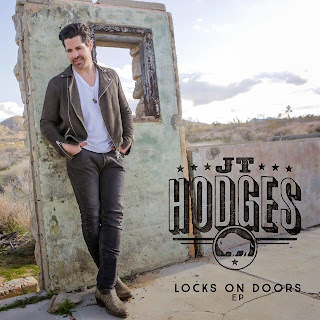 Up and coming country artist JT Hodges is back at it again with his latest EP "Locks on Doors" which follows his 2012 self titled album which spawned the hits "Sleepy Little Town", "Hunt You Down" and "Goodbyes Made You Mine.". The six track EP is without a doubt going to launch Hodges into the next phase of his career. The EP begins with the title track "Locks on Doors" where Hodges sings about slipping away from the crowd with a girl, locking the doors and ignoring the rest of the world for a bit. The second track and newest single "Ray Bans" is sure to be the perfect summer song. From the catchy background music to the infectious lyrics, this song will be stuck in your head for days. It tells the story of the girl that got away, but she still has his Ray bans to remember him by. The single is making big waves with fans and with Sirius XM's The Highway where it's been featured as a #HighwayFind, so be sure to let them know you want to hear it! The EP also includes the catchy tracks "Gonna Need a Guitar," "Girls Like It," "Wrong Side of the Bed," and "She's Alive," all of which are sure to find their way onto your everyday playlists. Hodges' father has always told him "it's all about being true to who you are" and I think it's pretty safe to assume that his father is proud of him for staying true to himself. He has such a unique country sound that will without a doubt payoff in the very near future. Live in the UK am a huge fan of JT Hodges!#locksondoors is an amazing ep!Love every track. #raybans is so catchy #perfect song for summer!#gonnaneedaguitar is simply beautiful.My favorite has to be #she's alive That's what his music makes me feel! #alive!! !#2015 is gonna be his year! !